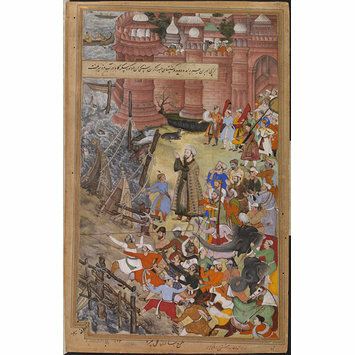 This painting forms the right side of a double composition depicting one of the most dramatic adventures in Akbar's life. The left side is IS.2:22-1896. Elephant fighting was a favourite sport of the court, and one in which Akbar loved to participate. On this occasion in 1561, the emperor chose to ride Hawa’i, known for his difficult character and bad temper, against another royal elephant named Ran Bagha. The concerned onlookers summoned the Prime Minister, Ataga Khan, to try and make the emperor stop. When Ataga Khan arrived, he was horrified at the danger in which Akbar had put himself, and the text records that the Prime Minister and all those around him, ‘great and small’, raised their hands in entreaty to God to preserve the emperor, as depicted here. Seeing that ‘the lionhearted King of Kings’ was determined to continue, Ataga Khan hid his anxiety. Eventually, Ran Bagha fled, energetically pursued by his opponent and royal rider. When they reached the river Yamuna, both elephants lumbered onto a bridge of boats which lurched up and down beneath their combined weight, making those on the bridge dive into the river for safety, as depicted in the left-hand page. Finally, the emperor managed to restrain Hawa’i, ‘who was like fire in disposition and like wind in swiftness’. The drama of the scene is emphasised by the turbulent water and the elephant breaking out of the frame of the composition, rather than by facial expressions, which are rare in Mughal manuscript illustration. Instead, concern, awe and fear are conveyed by means of the standard gesture of Iranian painting, in which onlookers lightly press a finger to the lips. The double composition was designed by Basawan, and Chatr completed the painting of this page. The Akbarnama (Book of Akbar) was commissioned by the emperor Akbar as the official chronicle of his reign. It was written by Abu'l Fazl between 1590 and 1596, and the paintings from this first, royal copy which exists only in partial form, were being prepared as the historian wrote and rewrote his text. After Akbar's death in 1605, the manuscript remained in the library of his son, Jahangir (r. 1605-1627) and later that of Shah Jahan (r.1628-1658). The Museum purchased it in 1896 from Mrs Frances Clarke, the widow of Major-General John Clarke, who bought it in India while serving as Commissioner of Oudh between 1858 and 1862. Painting, in opaque watercolour and gold on paper, this is the right half of a double-page composition. It depicts retainers watching Akbar riding the elephant Hawa'i as it chases another elephant across a bridge of boats outside the fort of Agra in 1561. At the top, the picture is overlaid by a caption of text, extending from the left-hand margin. 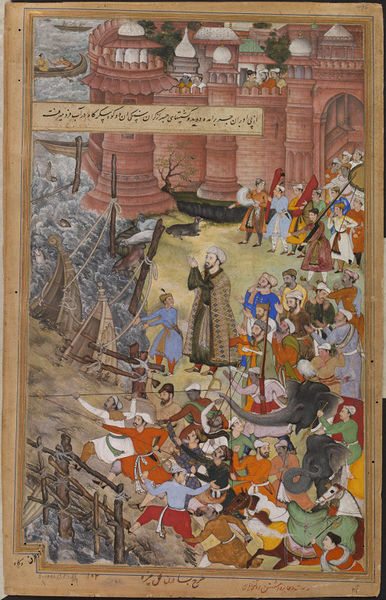 The Akbarnama was commissioned by the emperor Akbar as the official chronicle of his reign. It was written by Abu'l Fazl between 1590 and 1596 and is thought to have been illustrated between about 1592 and 1594 by at least 49 different artists from Akbar's studio. After Akbar's death in 1605, the manuscript remained in the library of his son, Jahangir (r. 1605-1627) and later that of Shah Jahan (r.1628-1658). The Museum purchased it in 1896 from Mrs Frances Clarke, the widow of Major-General John Clarke, who bought it in India while serving as Commissioner of Oudh between 1858 and 1862. Calza, Gian Carlo (ed.) Akbar: the great emperor of India. Rome : Fondazione, Roma Museo, 2012. ISBN 978-88-572-1525-9 (hard cover edition); ISBN 978-88-572-1793-2 (soft cover edition). p.256 , cat. no.IV.8. STRONGE, Susan. Painting for the Mughal Emperor: The Art of the Book 1560 – 1660 London : V&A Publications, 2002. 192p, ill. ISBN 1 85177 358 4.